Hola! Happy Cinco de Mayo! I got a bunch of chicken drumsticks from our local hispanic grocery store yesterday (Lola's--I love this place for really great deals! ), and simmered them in spices and chili powder, then baked them in a salsa with lots of green onion. 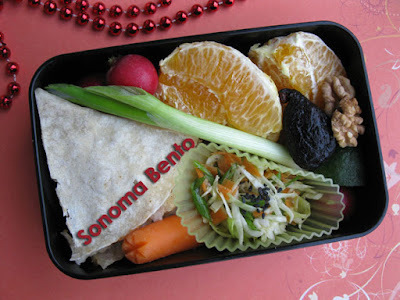 They turned out great, and made this bento very flavorful. This one had tortillas from La Tortilla Factory, a great company in Sonoma County. I think this one was pretty cute, and I remember that it tasted good. :) Are you doing anything fun to celebrate Cinco de Mayo? 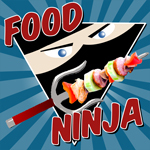 Any special meal planned for today? 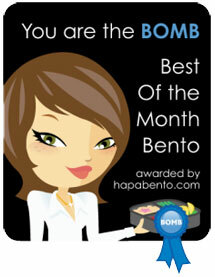 And remember, you still have time to enter my 1 Year Blogiversary contest, good luck! Loved aged white cheddar; quesadillas sound delicioso, and I make lime cabbage slaw too, with cilantro and onions, heh. Olé! Thanks sheri! I would have added cilantro to my slaw, but I didn't have any on hand. Have a great day! 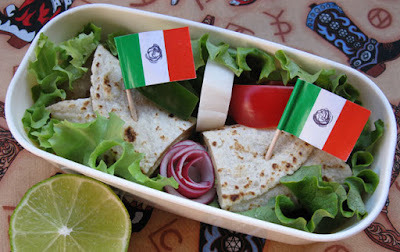 Love the Mexican themed bento because I love Mexican foods :D! Lovely! Cinco de Mayo food is wonderful (that might be the Texan in me). We buy fresh tortillas at our grocery too, the lady who makes them always give samples off the grill(?) and the kids nosh on them around the store. Hi Cooking Gallery! I love Mexican foods too, that was the hardest part about living overseas. Finding good Mexican cuisine in Europe is difficult.